When it comes to picking winners, there’s no shortage of opinions. There are the Vegas oddsmakers, the proclamations of football pundits, even video game simulations. And then there’s a dolphin at the Miami Seaquarium, who can make a claim not even the best lines-makers, talking heads or computer geeks can touch. Meet Flipper, the marine mammal with a knack for picking Orange Bowl champions. And who does he think will win this year’s matchup between Clemson and Ohio State? As you can see, this isn’t Flipper’s first go-around as a college football guru. And unlike every other "expert," Flipper has never been wrong about the Orange Bowl. He’s been getting it right since 2011, when he flipped his tail and launched Stanford’s beach ball out of the pool with a kick that would make Pelé nod in approval. The Cardinal rolled to a 40-12 win vs. Virginia Tech with the help of four touchdown passes from QB Andrew Luck. In 2012, he picked West Virginia over Clemson. Less than a month later, Mountaineer QB Geno Smith threw for six TDs and rushed for another in a 70-33 win over the Tigers. 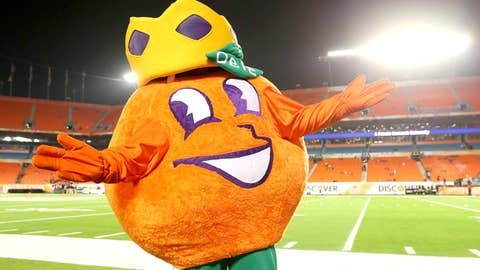 Outside the Orange Bowl, Flipper held a 2-0 record picking the winners of the national title until his selection of Notre Dame in 2013 put an end to his overall run of perfection. The Crimson Tide breezed to a 42-14 win over the Irish in that one. As you saw, when he got back to his strong suit, Flipper pegged Florida State to win the 2013 Orange Bowl. The result? Yup, the Seminoles took care of Northern Illinois 31-10. Florida State is in the BCS Championship Game this season. Could Flipper give the big game another spin, and go back to one of his Orange Bowl money teams to attempt to change his luck? We’ll sure be keeping an eye out.